I had been thinking about doing another pumpkin spice latte recipe for a while now, since it’s one of my favourite Fall beverages. I made a Pumpkin Spice Latte Bundt Cake last year, and I wanted to translate that into a layer cake for this year. Let’s talk about these adorable little pumpkins, because they’re clearly the stars of the show here. 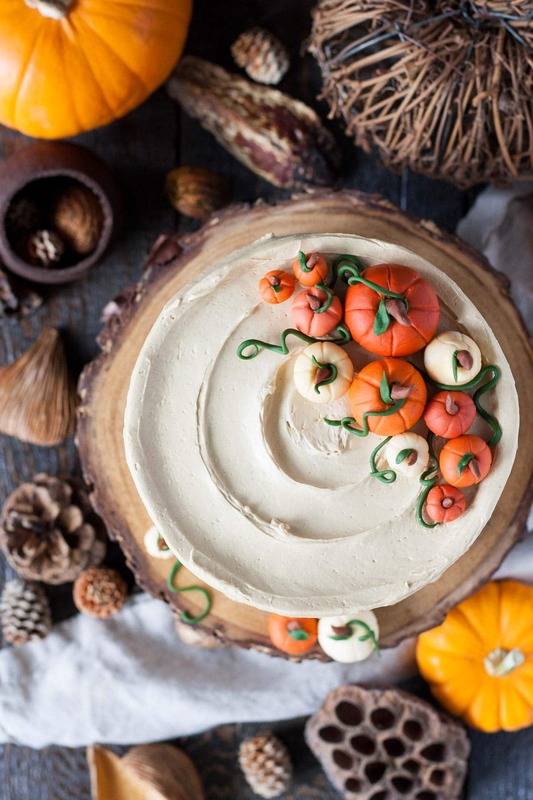 I wasn’t totally sure how I wanted to decorate this Pumpkin Spice Latte Cake initially — specifically, I didn’t know what to do with the frosting — but what I did know was that I wanted pumpkins on it in some way. I can be lazy, so I was really hoping to find some candy pumpkins that I could use as decorations. Sadly, the closest I found were these ones from Wilton, which would have been good except they’re flat on one side, and I wanted them to be perfectly round. Sticking two together wouldn’t be “clean” enough for the look I was going for, so I gave them a pass. I was going to have to resort to making my own. The old me would have been totally gung-ho for this, but the new me wasn’t particularly keen on it. Cake decorating used to be my main focus and I loved doing it, but it has been a loooong time since I’d worked with fondant or gumpaste in this capacity. I was hoping to find pre-colored orange and green fondant to make my life easier, but no luck, so I ended up buying some white fondant that I would have to color (SIGH). In hindsight, this actually worked out for the better, because I feel like there is more variety in the colors, and they’re not as bright as they likely would have been if I had used pre-colored fondant. Oh, and I actually should have used gumpaste instead of fondant as it dries harder, which would have been better for the vines. Can we talk about how much better the Wilton fondant is these days?? I hadn’t used it in years and have vivid memories of it being dry, hard to work with, and not very tasty. I’m happy to say that I was pleasantly surprised. It’s virtually the same as the marshmallow fondant I made a few months ago. In texture anyhow, I didn’t actually taste it. The pumpkins didn’t take all that long to make, and I totally enjoyed doing it. After the fondant was colored, I tore off small sections and rolled them into balls, then used a gumpaste tool (the teal one pictured here) to make the creases in the pumpkins. I rolled a tiny amount of brown fondant between my fingers until it resembled a stalk, and did the same with the leaves except I flattened them out (I attached them with a bit of water using a small, damp paintbrush). For the vines, I rolled a very thin strip and then coiled it around a chopstick. Here’s where the gumpaste would have been better — it would have dried quicker and been easier to work with, albeit more fragile. The fondant worked just fine overall, though. Note: if the fondant gets too sticky, just rub some shortening onto your hands and/or the fondant. I am obsessed with how these pumpkins turned out! Well, I didn’t take enough time to think about what I wanted to do with the frosting. I wanted the pumpkins to stand out, so I opted to go for completely smooth sides and top. Except that it wasn’t completely smooth and looked boring as *&^%. I didn’t realize this until after I spent well over an hour taking pictures and cutting into the cake. UGH. I hated this damn cake. So much. And just so you can see what I’m talking about, here’s a pic. After some much needed ranting and cursing to my friend Chrisy, I decided to redo the entire thing. Thankfully, I was able so salvage the pumpkins. I pulled them off the cake and stored them in an airtight container until I was ready to tackle it again. I know it’s not that bad, but it’s just not what I had in mind for this Pumpkin Spice Latte Cake at all. Version #2 went much better. I tried a naked cake style first, but thought it still looked too plain, so decided to go with swirls on the sides. I wish I had kept the top flatter, but oh well! It is what it is, and it is better than the first. I added more espresso into the second version as well, which added more flavour and color. OH except I just remembered that for some reason my frosting was totally grainy in the new cake. Like, completely grainy. I don’t know wtf happened there — I’d made swiss meringue buttercream dozens of times and it’s always perfect, but I guess I didn’t dissolve the sugar for long enough? When I tested it, it was hot and didn’t feel grainy. SIGH. Oh, and I also over-baked the cake this time (lol). Whatever. 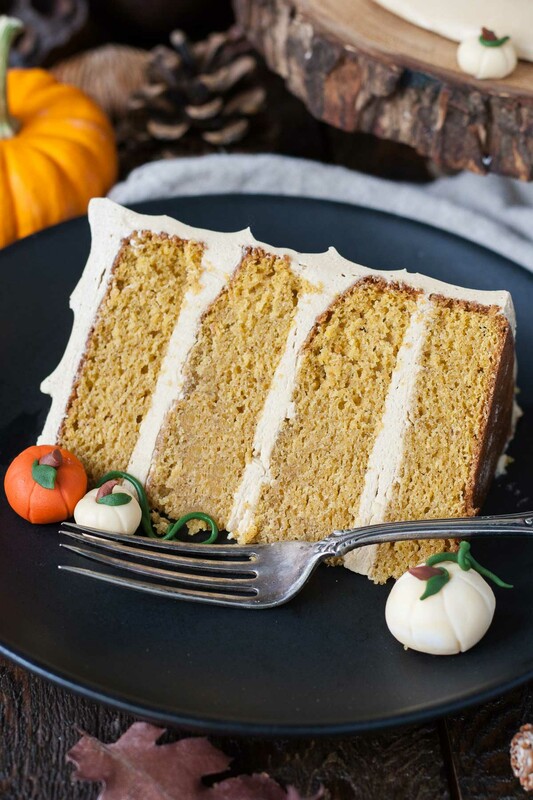 This Pumpkin Spice Latte Cake still tasted delicious, albeit a bit crunchy from the frosting. All in all though, I’m really glad I redid it! Be sure to use instant espresso powder (not granules) in the buttercream. Otherwise, dissolve the granules in 1 Tbsp hot water and let cool before adding to the frosting. 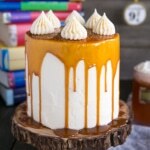 Your favorite Fall beverage in cake form! 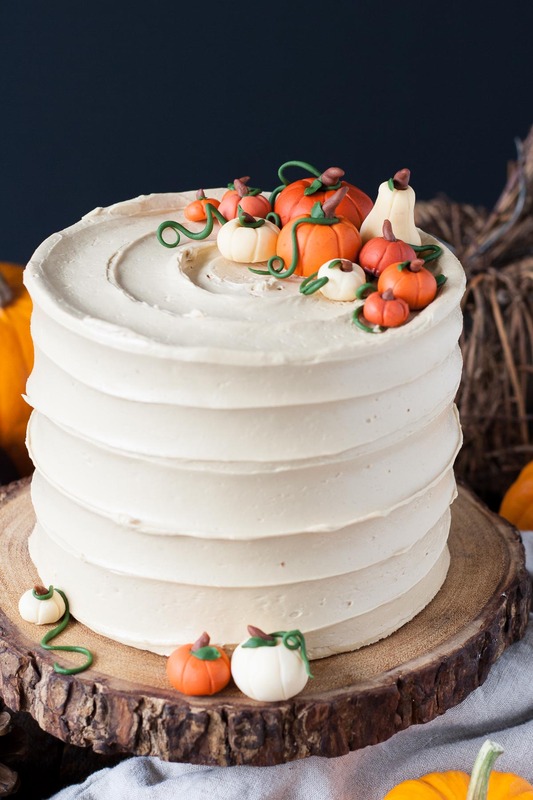 Pumpkin spice flavoured cake with an espresso buttercream. Preheat oven to 350F and grease & flour two 6" cake pans. In a large bowl, whisk together sugars, melted butter, oil, pumpkin, and eggs. Divide batter evenly between prepared pans and bake until a toothpick inserted into the center comes out mostly clean (approx. 35-40 mins). Cut each layer of cake in half horizontally. Place one layer of cake onto a serving plate or cake stand. Top with 1/2 to 2/3 cup buttercream. Repeat with remaining layers. Crumb coat the entire cake (thin coat of frosting all over the cake). Chill for 30mins. Use the remaining frosting to cover the outside of the cake. Decorate the top and sides with a swirl if desired (I used a large offset spatula to do this). 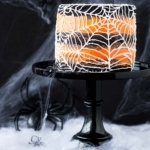 Decorate with fondant pumpkins. * Wipe your mixer bowl and whisk down with lemon juice or vinegar to make sure it is completely grease free and make sure there is no trace of yolk in your whites or your meringue will not stiffen. ** The buttercream may look like it's curdled at some point. Keep mixing until it is completely smooth. If it looks soupy, place it in the fridge for 20mins and rewhip. I made only the Pumpkin Cake portion of this recipe. – Made 1.5x the recipe and pour into one 8-inch round tin. Torted it into 2 layers. – Took 70 minutes to bake. I liked that this cake was mixed by hand and I didn’t need to use my stand mixer or hand mixer! Great, moist crumb while still being sturdy to stacking! Mine had a bit of a floral undertone in taste… not sure why and nothing bad at all! I used the Pumpkin Pie Spice from King Arthur Flour. I think next time I would add some extra Cinnamon! Hi Jennifer! Thanks so much for the feedback and tips. I’m so glad you liked it! Hi Vanessa! It will last in the fridge for a couple days, but you can make each component in advance and freeze instead until ready to assemble. Hello, I really love the sound of this and I have chosen to bake this cake for my Food Technology project. The problem is that I only have 100 minutes to mix, bake, cool it and ice it. I will make all the decorations the night before, but is there any way I could cut down the time? Is it possible that if I just do two layers by baking one pan, that the cooling and baking time are cut down? If so, could you please tell me the new baking heat and time? Hi Charlotte! If you bake in one pan it will actually take much longer. I suggest spreading the batter amongst 4 pans to bake up thinner layers. The baking temperature should stay the same but the time will vary depending on how thick the layers are. You can also cut the recipe in half. I’m thinking about making this cake for a trip this weekend and I need it to survive a 3-4 hr drive. My plan is to make everything ahead of time and then assemble/frost once I arrive. I have never made meringue buttercream, so I’m not sure how it would hold up. 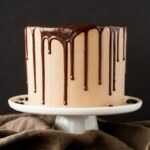 Would it be okay to make the buttercream ahead, store (chilled), then sit out at room temp a little bit before frosting? Also, I love everyone’s ideas for adding a little crunch layer. Any suggestions for a recipe for that part? I usually can’t wade through all the text to get to the recipes, but your was so entertaining that it went too fast. Can’t wait to make this. I love meringue buttercream. I think it would be amazing frosting with mint added on a chocolate cake(leave the pumpkin, sans spice, in for that dense moistness). Thanks so much Mary! I hope you love this one as much as I do. 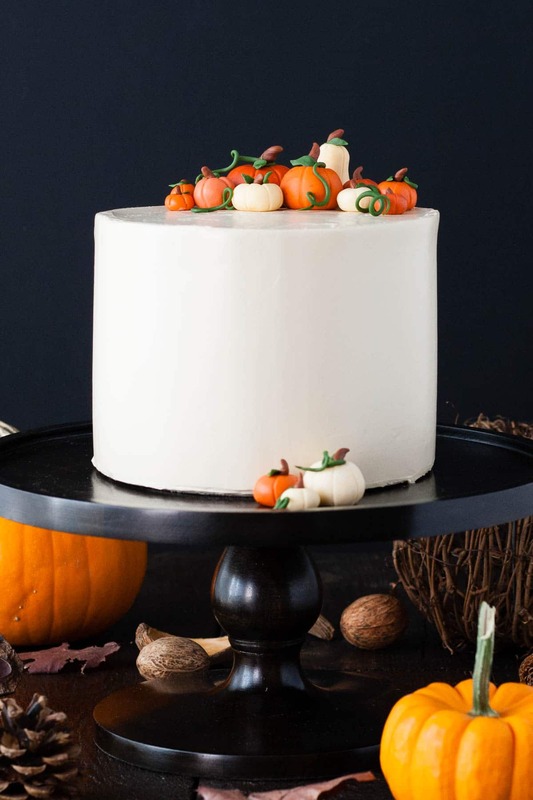 Your cake looks way taller and the layers look no where near as thin as they would be just using the two cakes cut in half to make the 4 layers, Did you double the recipe and make 4 6” cakes for this photo? I used the recipe as is. It made two 6″ cakes that were about 2″ tall so each layer is about 1″ tall. Going to use this design for my nieces baby shower in October. So, going to do a test run in the next few days. First time for Swiss meringue and my niece doesn’t like pumpkin so I’m going to do a vanilla bean cake with vanilla bean frosting. Her shower is Lil pumpkin themed, so she loves this design. Oh and I’m going to try to do the pumpkins with gum paste, I’ve never used it before, so lots of new stuff to try out!! Thanks for the inspiration!! Wish me luck!! Hi Joan! I’m so glad you’re going to try this design! Please send me a picture, I’d love to see it! Hi Olivia! 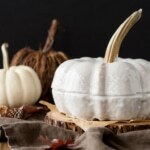 I tried making the terra cotta colored pumpkins today, but they came out pink, do I need to mix with the orange or yellow to get the shade that you did? And when I tested the frosting recipe, it went without a hitch and people loved it. Thanks! Didn’t take time to read through the entirety of the comments-but I did make cupcakes and it made 18! The frosting is oh-so-delicious! Awesome, thanks for the tip Sara! I can’t wait to try out your recipes! I’ve seen meringue buttercream recipes that say to heat up the eggs to at least 140 F. Is that not necessary? Hi Erin! It’s actually 160F. It’s ideal to do if you’re concerned about contamination from the whites. I’m too lazy to whip out a thermometer so just do it until it’s no longer grainy and hot to the touch. What is the size of the cake tin your using? Hi Lianne! I used two 6×2″ cake pans, but 6×3″ would work too. I have been searching my area for 6″cake pans and would you believe that I cannot find any? I did not check Walmart because usually the type they have there are not the best quality and that is what I am after when I buy pans or any sort of kitchenware now. I hate buying anything and having to buy it again because it is so cheap.Anyway I found just beautiful ones on Amazon and am waiting rather impatiently for them to arrive. I cannot wait to try those beautiful cakes I see on your posts!This is one that I will be making ASAP when I get my hands on those pans! Hi Carol! Bummer about the 6″ pans! But to be honest, I think I ordered mine all online — they’re not common in the stores here either. I totally agree about buying high quality pans too! I hope you love this one. Let me know how it turns out!! Hi Heather! My favourite are Fat Daddios. would the coffee buttercream be the icing? or could i️ add expresso powder to pumpkin spice cream cheese icing? would it possibly taste the same? Hi Brooke! It would taste quite different with a cream cheese frosting, but I imagine it would be equally delicious! I made this last week to test the flavor combo and recipe…OMG, YUMMMMMM! I added the streusel from the maple/pumpkin cake to this one, but substituted pumpkin pie spice for the cinnamon. It added a nice textural element and a little more spice flavor. It was a hit on Thanksgiving! I plan to make this recipe, but might use it for cupcakes. How many regular sized cupcakes do you think this would make? Hi Natalie! I’m not totally sure as I’ve never used it for cupcakes. Maybe 15 or so? Just a guess. I made this cake a couple of weeks ago and it was delicious! Thank you for sharing this!! Hi Clara! I happy to hear that you made it and liked it!! Thanks for sharing your recipes and tips!! 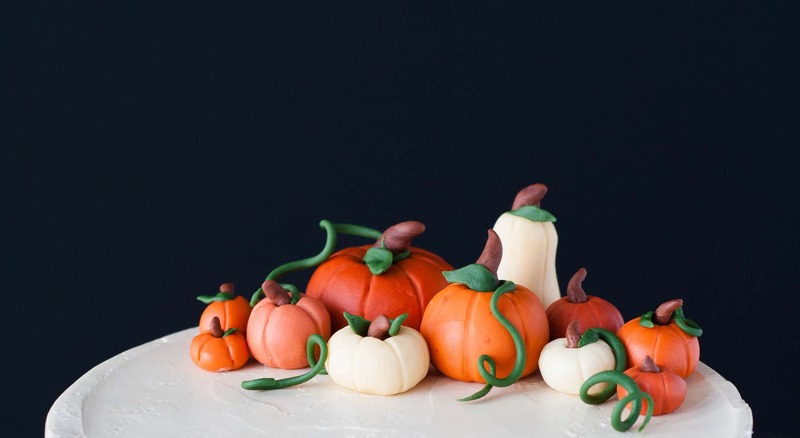 I want to try making these cute pumpkins, but I’ve never worked with fondant before, so I’m a bit scared. I also don’t have anything. I guess I’d have to start with getting the fondant and the coloring. I found a good deal on Amazon for a color kit. It’s not wilton, but it’s for icing, fondant, etc. As for the fondant, how many lbs should I get? And should I use as little color as possible? Also, how small/large are these? They look big, but since the cake is only 6in, I’m assuming they’re quite small. I’ve made at least 3 of your cakes in the last couple weeks and they have all been AMAZING. Thank you so much for posting delicious recipes. I ended up doing the cute little fondant pumpkins and they came out great. Cake was amazing! 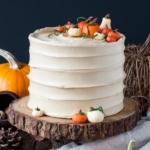 I decided to go with a cream cheese frosting instead of the swiss meringue because I knew most people I know liked the pumpkin/cream cheese combo. But I accidentally dumped the entire can of pumpkin puree into the cake. BUT, it came out SO moist and not overpowering at all! So. Good! Yay! So glad to hear you liked it 🙂 And yay for the fondant pumpkins!! Hi Liv! This cake was FANTASTIC! I made two last Halloween and both were a hit. 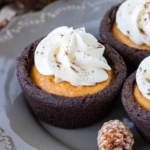 Not too sweet, perfect combo of flavors, and so suitable for fall. This year I was wondering what I would need to do with the measurements if I wanted to turn this cake into cupcakes, or into an 8″ cake. Do you have any suggestions? Yay! I’m so glad you liked it. I LOVE this cake. If you 1.5x the recipe, it should work for two 8″ cake rounds. Is that enough or do you want 3 layers? For cupcakes you can just use it as is, but reduce the baking time — start checking them at 15mins. Perfect, thank you! I’d like 3 layers for the 8″ so I guess I’ll double the recipe and just have a little extra for a small batch of cupcakes or something! Hi Olivia – what size is the can of pumpkin you are using? Hi Sarah! I think it’s a 15oz can, but I only use 1 cup of it. lol sorry apparently I’m just learning how to read. Thank you for replying. I made this for my “5th Annual-ish Pumpkin Dessert Off” vs. my brother-in-law and it was a hit! My mom only has two 9-in cake pans, so I doubled the cake recipe and it was the right amount. I did NOt cut them in half horizontally, and had just enough frosting as stated for each layer and the sides. Hi Sarah! Yay! I’m so glad everyone liked it 🙂 I actually never used to dissolve my espresso powder either, but mine is very fine and would incorporate fully. I love the idea of the rustic look! I just made this…my cake didn’t rise?? What did I do wrong…I’m remixing and decided to look at reviews?? Any guesses? Hi Myra! Is your baking powder old? It’s possible that it could be expired. You can test it by adding 1/2 teaspoon of baking powder to warm water. The mixture should fizz. Made this for thanksgiving. Looks way less cute than yours but absolutely delicious! Thanks for a great recipe and inspiration. Aww yay! I’m sure it looks amazing. I’m so glad you like it!! Did you double get recipe to make the four layers? Hi Ashley! No, I cut each cake layer in half before assembling. I baked 5 cakes of this recipe for some friends. LL OF THEM LOVED THE CAKE!! 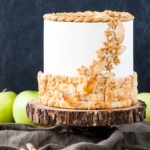 I added Coarsely crushed rice crispies coated on caramelizad sugar between the layers to give the cake an extra texture. This feature was absolutely a success. Everyone asked me what were “the crunchy bites”, and when I told them these were just rice crispier, they could not believe it! I would like to bake this cake for Xgiving dinner using three 9″ cake pans. How can I convert the measurements accordingly? Thank you very much, Olivia. I have baked all the recipes you post and I cannot thank you enough for all the wealth of baking skills you have added to my repertoire. Hi Susana! You are so sweet, thank you!! I’m so glad everyone liked the cake and great tip about adding some crunchy texture! Love that. I think if you want to use three 9″ cake pans you should 3x the recipe. Let me know how it turns out! would you happen to have the direction for that crunchy rice krispies you put in the center? Gorgeous work! I love the swirls on the sides and top of the cake. Can you share how you did those, or do you have a tutorial up elsewhere? Thanks! Hi Cameron! Thanks!! I don’t have a tutorial, but I’m sure there are some online. Basically, I smooth the sides and then press an offset spatula into the side of the cake and spin it as I move the spatula up. If that makes sense :). Omg I have all the ingredients to make this cake right now except for instant espresso! But I have coffee and a french press. Can I MacGyver an alternative? Haha yes, that should work! Just make it as strong as possible and try not to use more than 1 Tbsp of the coffee in the frosting (more might be ok but I haven’t tried). Oh and make sure it’s completely cooled before adding to the frosting! You outdid yourself with these adorable little pumpkins! And your espresso buttercream sounds and looks like perfection! I love the swirls on top! I can’t wait to see your next cake!! Grainy frosting can happen if you use ANY other brand of powdered sugar than C&H. Even a little bit of another brand can make it turn. This is due to some companies cutting their cane sugar with beet sugar!!! It took me a long time to figure out why sometimes my frosting was perfect and other times was grainy. Beautiful cake and sounds yum! Good to know, thanks Yvonne!! This looks gorgeous. I’d love to make it but I have a question. Butter weighs 113 grams per half cup. You list 1/4 cup but 170 g which I believe would be a cup and a half. Which is correct? Olivia, you constantly blow me away with your creativity and innovation! Your cakes are truly works of art. Bravo! Those pumpkins are the cutest ever! The cake looks amazing. 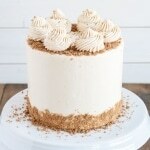 Totally digging the coffee buttercream! I love the pumpkins!! So happy with them. And that coffee buttercream is to die for! Absolutely Stunning! I bet it’s delicious to boot! Oh my gosh! I thought I was the only insane person who completely remakes recipes because I hate the way the photos turn out. SERIOUSLY. I have done it probably a dozen times. And it’s the worst when it’s a cake like this, with multiple components! It’s aggravating to be so picky, but at the same time, once that thought gets into my head, I loathe the pictures and HAVE to redo them before I feel comfortable sharing them. So, uh, I guess I’m glad we’re both crazy? Also I love that we’re mini pumpkin soul sisters this week. Great minds, etc! 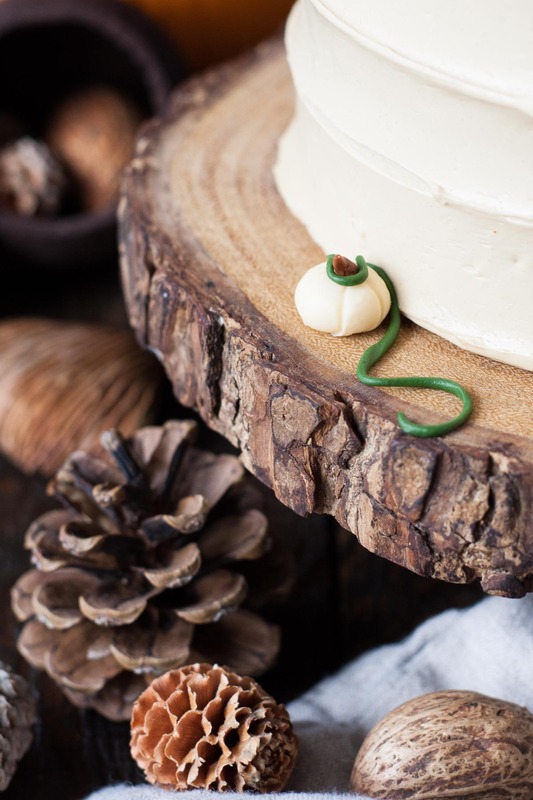 I adore the simple elegance of this cake (both versions) and the flavours, of course! The second cake definitely has more character, however both cakes are simply gorgeous! I could dig into either cakes just about anytime! Well the final version looks absolutely stunning Olivia! You are so persistent and have such patience! I greatly admire you and your talent! Those pumpkins on top are totally adorable and your photos are fabulous! That is maybe the nicest comment ever. Thanks so much Mary Ann! I don’t know if it’s patience or insanity — one or the other ;). 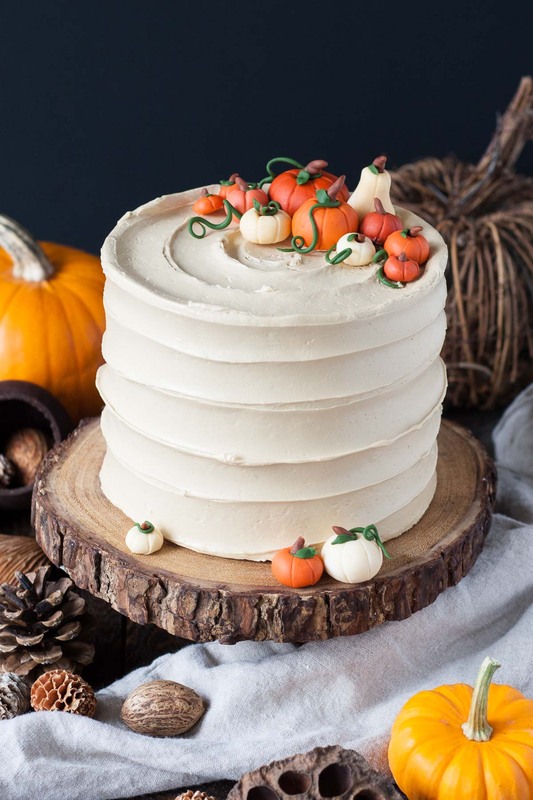 Beautiful cake and one of my favorite fall flavors!! The pumpkins are amazing! I will agree that the second cake has more character but I wouldn’t say no to a slice of either cake!! Thanks so much Kelly! I’m glad I’m not alone :). The cake was super yummy! 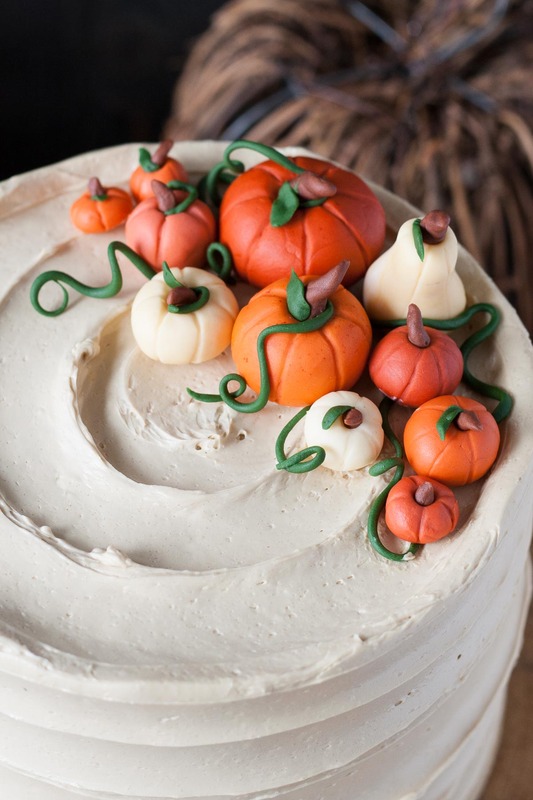 Omg coffee buttercream on a pumpkin spice cake sounds heavenly!!! 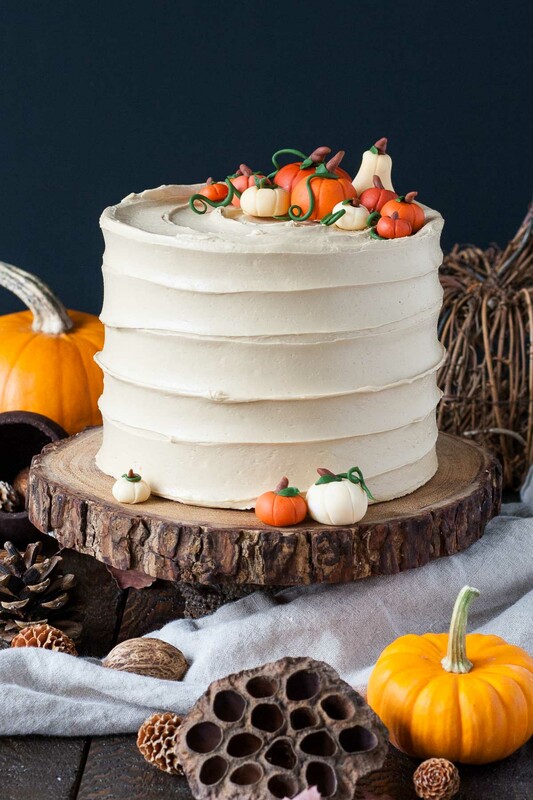 I love the way you frosted it, and of course those cute little pumpkins- stunning! Thanks so much Mel!! It’s a great tasting combo :). And I LOVE those pumpkins. Totally saving them :D.